Where to begin? First, Jody is a Michigan author (I live in Michigan) and this book is set on Mackinac Island, called Michilimackinac Island in 1814. Mackinac Island is my all time favorite place in the world to visit. I would move there if I could. If you’ve never been to this unique location you are missing out. Anyway, visiting Michilimackinac Island before it became a tourist location was so interesting. The Fort is a prominent feature on the island even now. Jody even got Arch Rock in the book and had the characters sit on it. This is not possible today as it is fenced off but how exciting to think that people native to the island did that. Just last fall my husband and I accidentally found Fort Holmes, the highest point on the island. Before it was Fort Holmes is was called Fort George, as it is in the book. We just visited the island about four weeks ago and took our kids to see this breathtaking view. I loved reading about the work that went into building this fort. Enough about the island, now the wonderful characters. Angelique is a lovely heroine. She doubts herself constantly and fears becoming like her mother. She hides her beauty but Pierre sees the beauty inside her. Pierre is a wonderful, strong hero, everything you want in a hero. Their passion is strong and Jody did a wonderful job of growing their romance until they both admit their feelings for each other. Of course things can’t go smoothly. Angelique is engaged to Jean, Pierre’s brother. My mind kept reeling with what would happen when he returned from the war. Would Angelique follow her passion or her commitment? You’ll have to read the book to see what happens. This book was so good I couldn’t put it down and was up way to late reading this one. If you love historicals and romance and if you want a glimpse of Mackinac Island before it became a tourist attraction, this is a must read! Grab your copy at your local bookstore, Amazon, Barnes and Noble, Christianbook.com, Deeper Shopping or Books-A-Million. The Scriptures declare that the Gospel of the kingdom will be preached in the whole world as a testimony to all nations, and then the end will come. This preaching and spreading of the Gospel will be done not by the ingenuity of men, but by the working of the Spirit of God. Do you want to be involved with God’s work at the end of the age? God uses the simple to confound the wise. His ways are not our ways. We need revival in our countries like what we see in the underground house Churches in China. May God teach, gather, and raise a remnant for His glory. Prepare for coming persecution in non-persecuted countries. 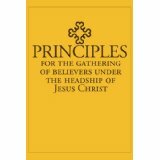 Learn Principles of how to gather as the Church from the Book of Acts and current underground Churches. Access resources that will help your gathering or house Church meeting. Experience personal revival and the Spirit’s empowerment. I was a bit hesitant about this book at first because I wasn’t really sure what it was all about. I was worried it might be about encouraging believers to leave their churches and start home churches. Although it does talk about home churches and underground churches it really is about so much more. Truly, the principles in this book are things every believer should consider and live out. There is a lot of truth in this book (and the book is free on Amazon) and even if you go to a huge church you can gain so much from these insights. Many of us are in small groups or life groups and these principles could also be applied to those small settings. I highlighted a lot of info. in this book but I will share a few quotes with you to give you a taste of what you will find. “A brother (William MacDonald) stated this truth, in another way: “Christ should be the gathering center of His people. We should be drawn by His presence, not by a man. When believers see this and act upon it, the local Assembly need not be shaken by the departure of any man. An Assembly where Christians gather to Christ has strength, stability and solidarity.”” What a solid truth. How many of us have experienced people leaving the church when a pastor leaves or a youth pastor leaves? We should not be attending a church because of a man but souly because of Jesus. I highlighted so much that I can’t possibly put it in this review but the book is free so I encourage you to grab a copy and read. I am sure you will be moved and encouraged and hopefully challenged as well. If we get these principles we should see a change in our church bodies, a change to more focus on Jesus and not on preferences. Grab your free copy at Amazon. I was asked to review this book in exchange for an honest review. TESSA AFSHAR was voted “New Author of the Year” by the Family Fiction sponsored Reader’s Choice Award 2011 for her novel Pearl in the Sand. She was born in Iran, and lived there for the first fourteen years of her life. She moved to England where she survived boarding school for girls and fell in love with Jane Austen and Charlotte Bronte, before moving to the United States permanently. Her conversion to Christianity in her twenties changed the course of her life forever. 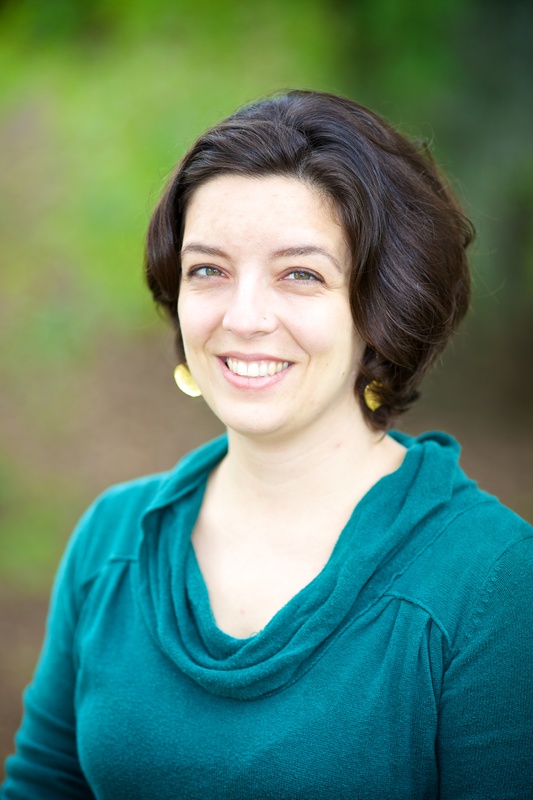 Tessa holds an MDiv from Yale University where she served as co-chair of the Evangelical Fellowship at the Divinity School. She has spent the last thirteen years in full-time Christian work. Destitute, grief-stricken, and unwanted by the people of God, Ruth arrives in Israel with nothing to recommend her but Naomi’s, love. Her loftiest hope is to provide enough food to save Naomi and herself from starvation. But God has other plans for her life. While everyone considers Ruth an outcast, she is astounded to find one of the most honored men of Judah showing her favor. Long since a widower and determined to stay that way, Boaz is irresistibly drawn to the foreign woman with the haunted eyes. He tells himself he is only being kind to his Cousin Naomi’s chosen daughter when he goes out of his way to protect her from harm, but his heart knows better. Based on the biblical account of Ruth, In the Field of Grace is the story of a love that ultimately changes the course of Israel’s destiny and the future of the whole world. 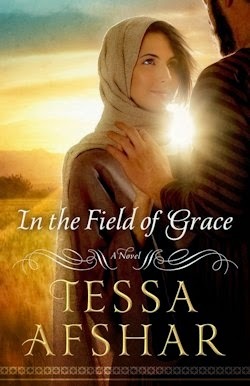 If you would like to read the first chapter of In The Field of Grace, go HERE. I have always loved the story of Ruth and Naomi. Ruth faithfulness, giving up everything to go with Naomi. And then her relationship with Boaz. I never gave much though to how Boaz and Ruth might have spent time together before Ruth went and laid at his feet. But Tessa does a wonderful job of creating a story world that is very believable. Tessa paints a picture of Ruth with a unloving family, aside from her grandfather, no one else in her family seems to care much for her. This makes it very easy to see why Ruth wouldn’t want to return to her family after the death of her husband. Naomi’s grief seems so heavy and real and that you will feel the weight of her sadness with the loss of her two sons. Boaz is depicted as a handsome hero who has had his own share of heartache. He fights the growing desire he feels to be in Ruth’s presence but they tend to find each other in the other’s company over and over. 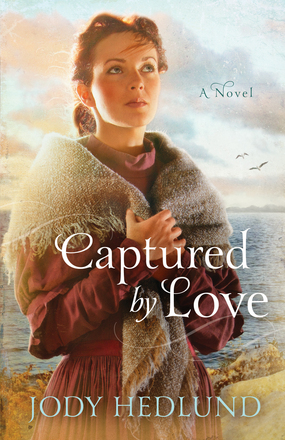 A copy of this book was given to me by the publisher through the Christian Fiction Blog Alliance in exchange for an honest review. I was praying about an individual in my life the other day and God gave me a visual about finding the treasure, the gold, in that person. I want to share it with you because maybe there is someone in your life who you’re struggling to find the gold in, that you are about ready give up on. Hope this blesses you. Like panning for gold you have to shift through the muck and mire to find the treasure. It takes a keen eye and a lot of time, it will be back-breaking work, you will get tired, you will want to give up. Don’t. It is there we just need to keep looking. It will be found. You have to go lower to find the gold, you have to dig under pieces of broken rock, dirt, mud. Gold isn’t easily found, it must be sought after, it must be specifically looked for, you will not accidentally find it. You have to look for the gold only, look past the dirt and look for the stuff that sparkles. When it catches the light of the sun (Son) you will know you have found the treasure. I also heard this amazing song and wanted to share it with you. Take a minute to worship the One that hears your prayers and is moving even if you can’t see it right now, He hears your heart and loves you too much not to listen to you and do what is best for you. Click here. A nightmare of cataclysmic proportions. Jack and Pamela Crittendon have hit the breaking point. After months out of work as a reporter, Jack is playing Mr. Mom and working part-time at Festival Arena with his survivalist friend Brian Shakespeare. Meanwhile, Pamela has gone back to work full-time while eight months pregnant. Having her recently widowed mother on hand isn’t making matters any easier. With financial pressures boiling, Jack reports for duty at a rally for controversial presidential candidate Martin Sterling where he expects a mindless night on the job. But when Homeland Security picks up intel about a potential terrorist threat, Jack and Shakespeare are thrust into a life-or-death battle to save their own lives–and the lives of thousands of innocent people.This third book in The Crittendon Files reminds us of the power of family, friendships and faith–and why we are never in as much control as we think. Creston Mapes is one amazing writer. I absolutely loved the first two books and wasn’t sure how I could love this one more, but I think I might. This is a book that had me up way too late but I couldn’t put it down. Creston does an outstanding job of making the terror and chaos feel so real. He throws new twists and ramps up the tension with each chapter, adding another element that makes things more nail-biting. Jack and Pam are in a tough spot financially at this point in the third book. The weight of paying bills weighs heavy on Jack and Pam is overwhelmed with working outside the home now and being pregnant. All of these facts play into the situation that plays out at the arena. I love how Creston ties everything together, even the things you think won’t contribute to the overall story, they do. Grab a copy at your local bookstore, Amazon, Barnes and Noble, Christianbook.com, Deeper Shopping or Books-A-Million. An ecopy of this book was given to me by the publisher through Netgalley.com in exchange for an honest review. Today we get write to the point with Jessica Snell. I’m a missionary kid, so “where are you from?” is one of the hardest questions out there! In order: Texas, Mexico, the Northwest Territories, and Southern California (with a bit of Oregon thrown in). My husband’s another missionary kid, and he grew up on Indonesia. We live in a suburb of Los Angeles now, and we have four kids (including a set of twins!). I’ve been writing as long as I can remember, but I started seriously pursuing publication about seven years ago. I was raised in a Christian home (my parents were missionaries, actually), and I remember praying to the Lord Jesus when I was two or three. Later, as a teenager, I decided to really claim the faith as my own, and I read through the whole Bible, and read a lot of apologetic works, like “Mere Christianity” by Lewis and “Love the Lord with All Your Mind” by Moreland. I never stopped being a Christian, but that stage of maturation in high school was very important to my faith. 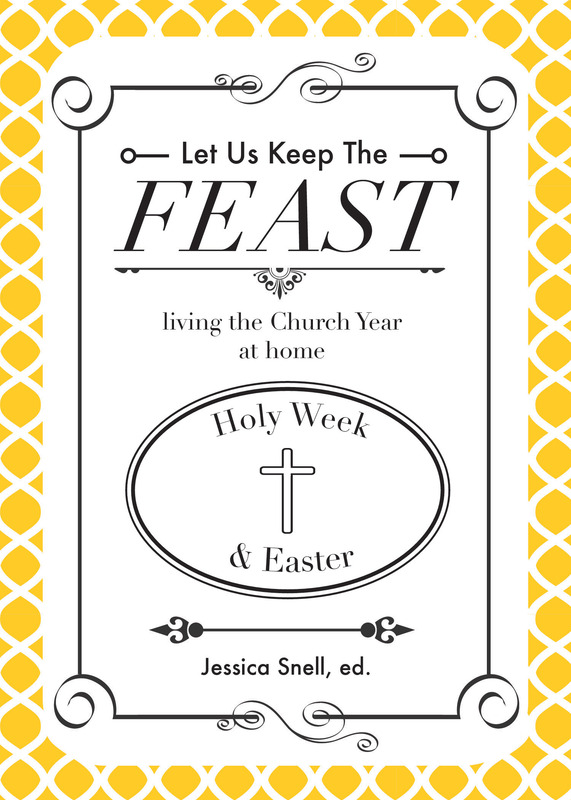 My latest book is “Let Us Keep the Feast: Living the Church Year at Home.” Each chapter covers a different season of the church year, and is full of history, recipes, prayers, and other resources. It’s really the book I wish I’d had ten years ago, when I started trying to celebrate the church year at home. I’d love people to come away from reading it feeling more empowered to make their faith a part of their day-to-day life, and feeling like they know how to celebrate the feasts and fasts of the church year in their own homes. I blog about three times a week, and I cover the topics of “faith, fiction, and family”. So, on my blog you’ll get everything from recently-tried recipes I’ve loved, to book reviews, to what I’m learning on my mothering journey. I just finished a glut of fantasy books (“Mistborn”, “Chalice”, & “For Darkness Shows the Stars”), so I’m reading C.S. Lewis’ “The Problem of Pain” as a palate-cleanser. One painful time that immediately comes to mind was the time I broke both my arms at the same time (well, technically, one right after the other), during a karate test. It was horrible! I had an eight-month-old baby at the time, and I couldn’t even lift her up to nurse her! But in the middle of that hard time, the Lord really showed me the goodness of His church. Friends and family gathered around and helped us, and I felt, for the first time, that I understood how God’s people serve as His “hands and feet”. Not a verse, but I very regularly return to the Psalms of Ascent (they start with Psalm 120). Those short songs resonate with me every time I read or hear them. I blog at “Homemaking Through the Church Year”, and at this page of my website, you can find out where else I’ve had the privilege of writing. I’d just like to add my thanks for having me over! I’m delighted to have had the chance to talk to you and your readers. Thanks for sharing with my readers today, Jessica. We love hearing from new authors. Millions of women in the United States battle with after-effects of suffering so great they’ve developed post-traumatic stress disorder—the same suffering experienced by soldiers who’ve gone through war. Sexual and physical abuse, catastrophic accidents, abandonment, natural disasters, invasive medical procedures, and many other painful and overwhelming events can trigger symptoms they are little equipped to deal with and hard-pressed to recognize. 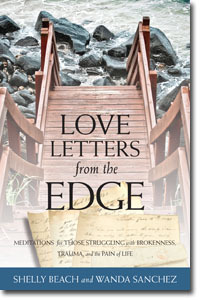 Love Letters from the Edge provides a voice for those struggling to express this pain and reveals intimate encouragement for those in desperate need to hear God’s words of love and deliverance. This heartfelt devotional focuses on the profound laments in the book of Psalms. Each meditation begins with a letter from someone in the throes of despair and then offers a tender response to their pain from God’s perspective. Fresh, honest, and intimate, Love Letters from the Edge will reach readers who never expected to hear good news from where they are and point them toward the hope and healing of Christ. There will be a letter in this book for everyone. You will find at least one letter you can relate to, but I am sure you will find more. It’s obvious that Shelly and Wanda have a heart for women to find healing, this is my heart’s cry as well, so I very much appreciate the work they are doing. This book actually reminded me how I used to connect with Jesus and since then I have gotten back to a very intimate place with my Savior. My only suggestion might be to make the letters more general. Some of them were very issue specific, even using names of people that must have been in Shelly or Wanda’s life. I found myself skipping over the letters that had nothing to do with me. I think the wounds that were brought up need to be prayed over, however, I would’ve like to see it more general and without anyone’s name who I didn’t know, I found that distracting. With that being said, this is a very powerful book and maybe this is a book you purchase and then share with others, maybe even mark the letters for the person you share it with and ask them to pass it on. As I read I kept thinking who I could pass my book on to. Grab your copy at your local bookstore, Amazon, Barnes and Noble or Christbook.com.